I was flipping through an old House Beautiful (September 2007) last night and profusely declared my love for the above spread to Bryan. “You’re obsessed with white” was his seemingly harmless response. After about ten minutes of mild stewing, I finally admitted that ok, maybe I’m a tad bit obsessed…a smidge, but it's not a 100%, full-blown obsession. But then I was daydreaming on my way to work about what I really wanted to buy right now (sad, I know), and much to my surprise, it wasn’t anything frivolous or fun or, well...colorful. No, it was all just a bunch of white stuff… a stack of new white towels, a white Le Creuset casserole, a couple of Urban Outfitter’s comfy white slips that do double duty as nightgowns and extra-long layering pieces. So yes, it appears I might actually be obsessed. its so clean... and well... LOVELY. i must say there is something wonderful about white towels and sheets. I am a fan of color, but some things are just better in white! I love white too. That last photo in the kitchen is my favorite. ha! i just searched ebay for that same pot. i share your "mild" obsession. 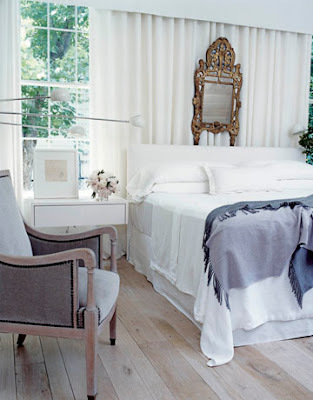 White is my standby for everything, particularly linens and clothing. And well I guess I own white dishes. And have white bead board in my bathroom. I'm certain I could come up with more. It's a classic standby. 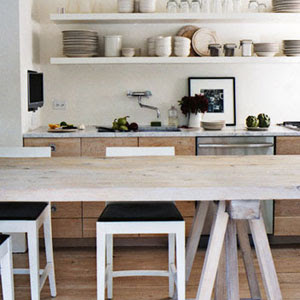 These rooms are gorgeous and so much more than white. There's a beautiful balance of dark and light in each of them (especially the top two) and of texture and organic form. I'm a fan off white too but only when it includes these elements. All white and minimalistic makes for a very different feeling. I love white as well...pops of color too but I prefer a clean white backdrop/canvas for things! i too think i my now be obsessed with your picks. it is kind of annoying when the husband is right, eh? 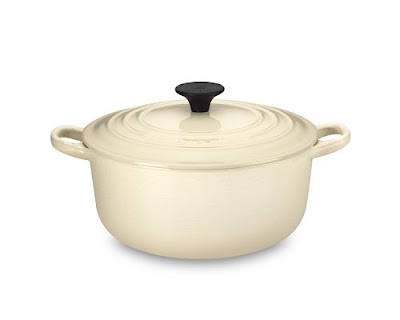 I love the crispness of white and LURVE the white Le Creuset. I am recently jonesing on white, too, after many years of deep rich colors.I even tried painting pictures in white. Phht! harder than it looks. I think the white thing lately is a zeitgeist thing. Perhaps a longing for simplicity and purity. I love a clean, white palatte with a few pops of color here and there. It really makes a room look simple and inviting. But with a messy dog and a disagreeing husband, my fondness of white may only be realized in very small increments. hehhe, yup! You just got your head all cleaned out with not buying anything, and now you crave the simple basic pleasures of form and function. I have the photo of the living room on file, but had no idea where it came from. I'm so glad you posted it!! Also, I have been working on a job that will replicate that minimal fireplace surround. Very cool. i'm with you 100%. 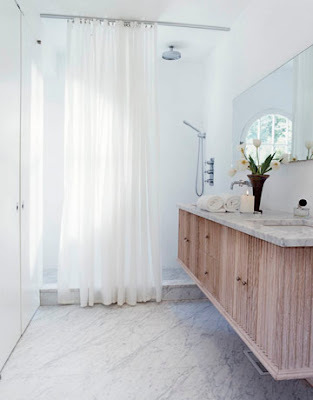 it just makes everything seem so clean and refreshed and it's so beautiful when done in a home. love the pieces you chose here. Dreamy house. White is simplicity at its finest. I am crazy over the white photo up top. I adore white too and most of my friends think I am crazy. me too! so fresh and crisp and clean. (and thanks for the link to the slip--someone told me the other day that i was old-fashioned for wanting a slip--but a girl can't have static-y tights all the time. thanks! I've been trying to convince my husband to paint all the wood frames and walls white in our house. He looks at me like I'm nuts, but I can't help it — white walls makes everything look so bright and beautiful. I'm obsessed with Scandinavian homes. its alright ... it seriously is the best. I am in total agreement!!!! 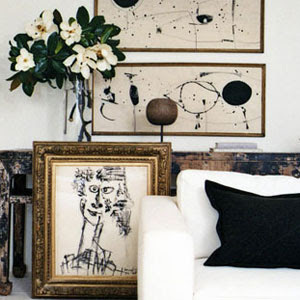 Nothing makes me happier than a beautifully done white room full of texture and vintage finds. So perfect. It seems you have a lot of fellow obsess-ees. I can be counted as so, as well. The husband and I just got in from Europe and went to the obligatory Target looting spree. I had to pull myself away from their line of white dinnerware! Ahhh! I don't even have a home but I want it all! My husband and I had the same argument...well discussion...that I have grown a diversion to color. I think it is my search for tranquility in our home.